Modern binoculars consist of two barrel chambers with an objective lens, eyepiece, and a pair of prisms inside. The prisms reflect and lengthen the light, while the objective lenses enhance and magnify images due to stereoscopic vision. Man has been experimenting with glass since its advent sometime around 3500 B.C. These experiments soon became known for their ocular implications. The designs of early optical instruments, like the telescope, were not recorded. It is assumed that these instruments were studied and perfected by Galileo Galilei. Early binoculars were actually called binocular telescopes, and are thought to be based on Galileo's discoveries and designs of prisms. Early telescopic lenses were full of bubbles and other imperfections. They were also slightly green due to the iron content in the glass. Polishing techniques were crude, and although lenses were of good quality in the center, the peripheral shape was poor resulting in a restricted aperture. As telescopes were improved, binoculars evolved. The first patent application for binocular telescopes was filed early in the seventeenth century by Jan Lippershey in present day Holland. Lippershey primarily used quartz crystal, which is hard to manipulate. The first hand-held binocular originated in 1702 with Johann Zahn's small binocular of two tubes with a lithe connection. A patent application submitted in 1854 by Ignatio Porro began the use of the modern prism binocular called the Porro prism erecting system. 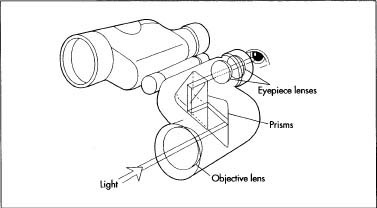 This optical system consisted of an objective lens and ocular lens (eyepiece) with two facing, right angle prisms arranged to invert and correct the orientation of the image. The two most commonly used prism systems are the porro prism and the roof prism design. The roof system uses prisms positioned one over the other resulting in a more compact design. An other major breakthrough occurred in 1894 when Carl Zeiss, a German optical specialist, developed binoculars with convex lenses and delta prisms to correct the inverted image. In a porro design, the light is bent in a "Z" shape before reaching the eye, allowing the distance between the eyepiece and the objective lens to be compacted. This enables the size and weight of binoculars to be reduced. Reductions in the weight of the binoculars occurred with the use of aluminum or polycarbonate housings instead of the heavier metal alloys used in pre-civil war binoculars. Performance of smaller and larger binoculars has improved with the introduction of coatings to render the lenses non-reflective and reduce the amount of scattered light. The quality of prisms has also improved over the years, resulting in a reduction of the bubbling effect of optical glass. In the early 1970s, nitrogen filled, waterproof binoculars were developed. A decade later the arrival of infrared transmitters capable of seeing in the dark further transformed binocular technology. Variable magnification models were also developed allowing the user to adjust the level of magnification. The process of magnifying the image. to produce. Subsequent leather or hard rubber covers were replaced in Germany during the World War I by a cover of black lacquered cardboard. Galvanized steel replaced the heavier brass in the housing covers. In the 1930s, nearly all of the metal parts of the service glasses were made of aluminum to save brass and reduce the weight. Modern-day binocular tubes are primarily made out of aluminum coated with silicon or a leather-like material called gutta-percha. The lenses and prisms are made from glass and coated with an anti-reflective coating. With the exception of the optical glass and some rubber seals, the majority of binocular component parts can be manufactured using a Computer Assisted Design and Manufacturing (CAD/CAM) system that downloads the designs to a variety of Computer Numerically Controlled (CNC) devices (multi-axis mill turn and milling machines as well as vertical and horizontal machining centers, lathes, etc.). Using CAD software provides both drawing, dimensioning, and visualization capabilities. These lead to improvements in the binoculars final design. The lens material is poured into a lens mold, which has a spherical curved bottom. This results in a lens that is about 4 in (10.2 cm) in diameter and 1-1.5 in (2.4-3.8 cm) thick. The lenses are then removed from the molds and cut into specific pieces using a diamond saw to create the optical lenses. The lenses are placed into the grinding machine and polished. After they have been carefully machined, the lenses are anodized to reduce reflections in vacuum tanks. The more coatings applied, the less light absorbed. The ocular lenses (nearest the eyes) are also molded and carefully polished by auto-polish machines after which they are centered on diamond turning machines and finally cleaned by running through several different solvents in automated machinery. The objective lenses, those furthest from the eyes, are molded and then polished with polishing machines. These components are then manually assembled into a die cast body, which is often made from aluminum. Using a technique called physical vapor deposition, the optics are placed into a "plasma machine" and coated with dielectric coatings. The coatings are essential for high performance. The optics are then inspected and tested for clarity and defects using lasers in specially designed particulate free rooms. Next, the rod shaped prisms are cut by lasers into three-sided shapes depending on the type of prism being manufactured (i.e., roof prisms or porro prisms). The prisms are coated with dielectric materials (metal oxides) by physical vapor deposition inside a vacuum chamber. When all these components are assembled on a belt assembly line, the final assembly station collimates the binocular by hand, making the left side exactly parallel to the right, so only one image will be seen at a time. The binocular housing is then covered with a substance called gutta-percha, which looks like leather but is more durable and flexible. This covering is applied by hand using an adhesive and may be coated with a protective rubber covering. On the assembly line bare metal housing covers are covered with plastic or rubber. The prisms are placed by hand inside the binocular casing and manually screwed in place. The objective lenses are held in place by a metal or plastic ring and the eyepiece is fitted with a rubber eyecap. The focusing lenses are placed in the housing with screws mounted by hand. Waterproof binoculars must have orings at every orifice, be purged with nitrogen (injected through a seal), and sealed. The final step would be the packing of binoculars in cases with neck straps, most cases today being of a canvas-like material. Binoculars that have been hermetically sealed (waterproof) and nitrogen charged (fogproof) are tested underwater. Most binoculars will withstand water immersion at 16.4(5 m) for five minutes. Both barrels of a binocular need to be optically parallel for the image to merge into one perfect circle and are carefully checked for alignment. Lenses and prisms that have defects such as scratches or cracks are either discarded and melted down to be molded again, or they are recycled. If the casing is damaged during production, it is also either remolded or recycled. Binoculars continue to advance with new technology. Their ability to see further with better focusing techniques enables the consumer to use the product for a wider variety of tasks. Binoculars are now tending to use the same stabilizing method used in video cameras that automatically stabilizes the prism system so that the image remains steady to the viewer. Some binoculars are also coming equipped with night scope vision. This would enable the consumer to see objects that are far away even at night. Technological advancements are continually made on these specialty binoculars, which are primarily used by the military or for surveillance. Bell, Louis. The Telescope. McGraw-Hill Book Company, Inc., 1922. Von Rohr, Moritz. Die Binokularen Instrumente. Berlin: Springer, 1920. The United States Patent Office Web Page. November 2001. < http://www.uspto.gov/patft >. Van Helden, Albert. The Telescope. 1995. November 2001. < http://es.rice.edu/ES/humsoc/GalileoiThings/telescope.html >. CAN YOU EMAIL ME THE MANUFACTURING PROCESS VIDEO? I NEED IT BECAUSE I HAVE TASK GIVEN BY MY LECTURER. THANK YOU.